DSC_0117.JPG, originally uploaded by michael_jecks. This place is truly incredible. It beggars belief that this once thriving community was created, and then destroyed in the reign of Henry VIII, purely because of his argument with the Pope, his greed, and his determination to rule as he pleased, with the right to marry whomsoever he wished. Please look at some of the other pictures on my Flickr site to see the scale of this place. The height of the remaining walls is fantastic, and when you see how high, for example, the arches are that you can just see in the centre, you begin to understand how the walls must have soared over any man’s head. Truly an expression of God’s magnificence in the eyes of any visitor. It was intended to overwhelm, and I think it would have succeeded. Enormous. It was the second most wealthy of the great ecclesiastical institutions. Only Westminster took more money, and there was a good reason for that. 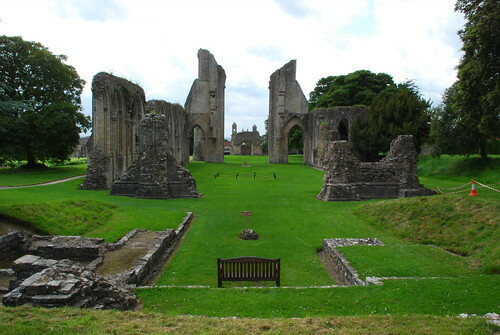 Glastonbury was rumoured to be the burial place of King Arthur and Guinevere. King Edward I decided that when he needed a rallying news item for the realm when he was keen to instil some patriotism in the late 1200s. So he thought up the publicity scam that was the discovery of Arthur’s tomb. It had two purposes: first it gave a fillip to his British subjects; second, it denied the same fillip to the Welsh, who were trying to claim Arthur as their own. If he had the bones, clearly no Welsh King Arthur would rise to protect the Welsh from the English. Oh, and the Abbot was keen to support the King’s claim. Well, there were many pilgrims who’d be sure to travel to the abbey to see Arthur’s relics. Such bones were worth a fortune. If you go to Glastonbury, you’ll see a pub that’s prominent on the High Street. Stop and enter the George and Pilgrims. Look up at the lintels inside there. The place was built to accommodate pilgrims from 1470 or so. And it is still an inn and hotel now. Not many businesses have proved so successful over 550 years or so! This entry was posted on Monday, June 9th, 2008 at 9:27 pm	and is filed under Dartmoor. You can follow any responses to this entry through the RSS 2.0 feed. Both comments and pings are currently closed.